We survived our first day at Disney World: Hollywood Studios. After an exhausting day, we tried to get to bed as early as possible because it was a very early start on Day 2. 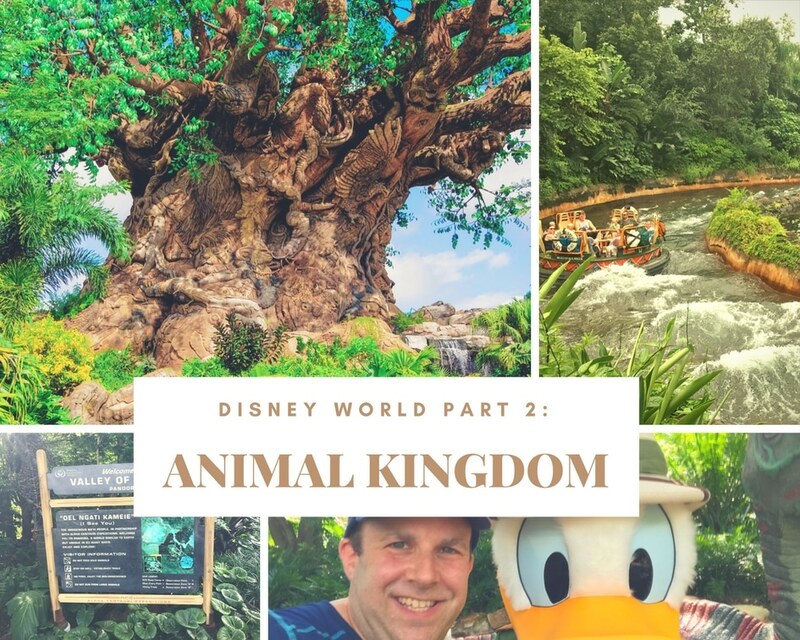 Yes, our 2nd day was a wild one as we ventured into Animal Kingdom! Up before 6 am (If it weren’t for my wife, I think the entire rest of our group would still be sleeping right now! ), me, Allie and the boys were up, dressed finished breakfast and got on line for the bus well before 8 am. Thankfully her cousin Ivy and her family made it in time as well. The reason for such an early start? 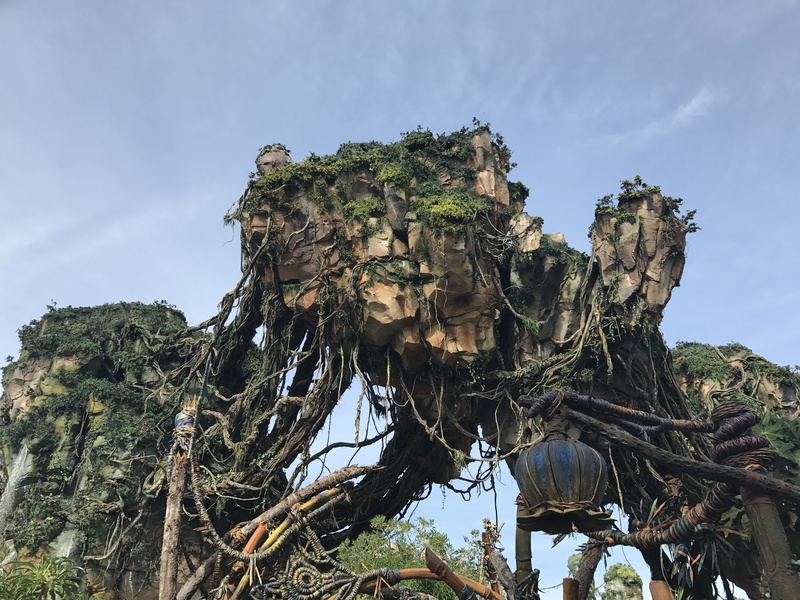 That’s easy: Animal Kingdom’s newest section: Pandora! We had already scheduled one of the Pandora rides for a Fast Pass, but of course, we picked the wrong one. The Avatar Flights of Passage ride is apparently the hottest thing going with crazy long weight times. And yeah, we hadn’t picked it as a fast pass. Our solution? Get to the park before it opens and run full speed to the ride, hoping it’s less than an hour wait. And thankfully, Allie’s plan worked to perfection. Thankfully we recently watched the movie Avatar with the kids, so they knew what it was all about. 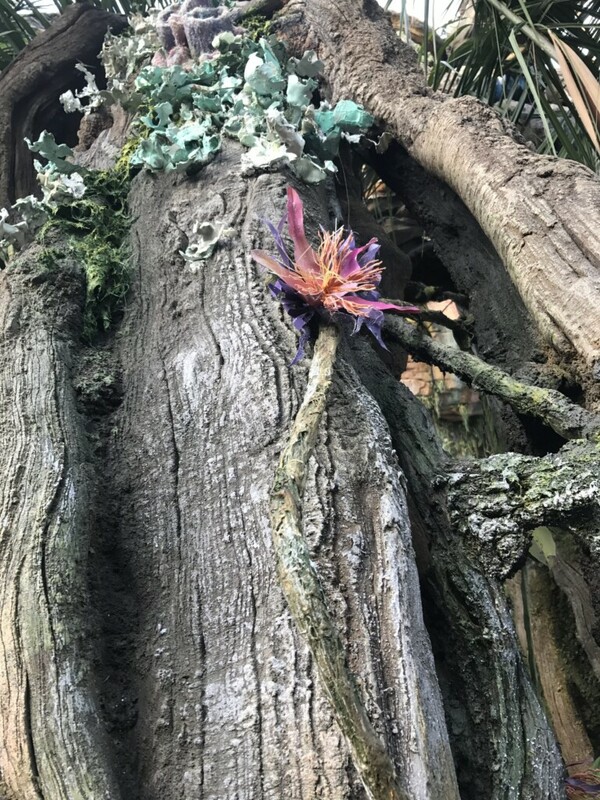 The entire fictional world of Pandora was fresh in all our minds when we entered this breathtaking new part of Disney’s Animal Kingdom. 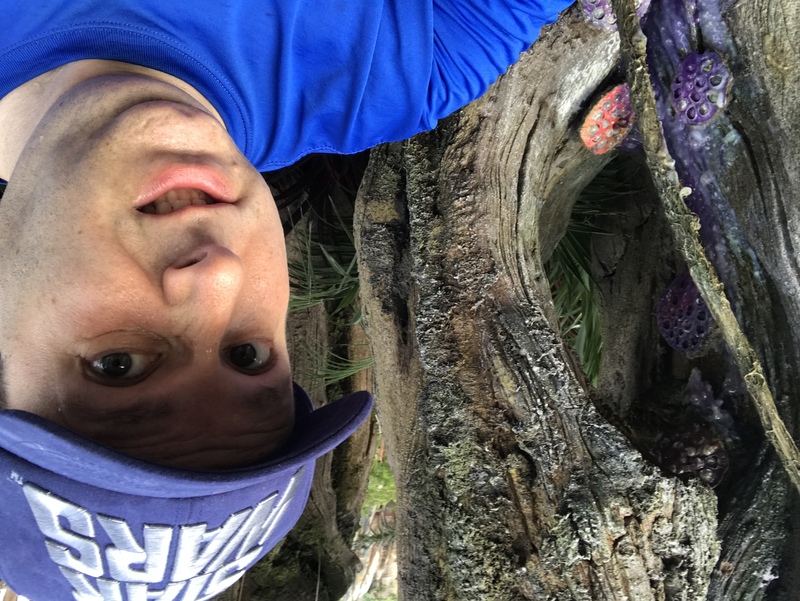 Even if you don’t go on a single ride, it’s worth the trip to Orlando to walk amongst these alien plants and wildlife. Seriously I have no idea how Disney does it but you really feel like you’ve stepped into another world. The giant seemingly floating rock formations. 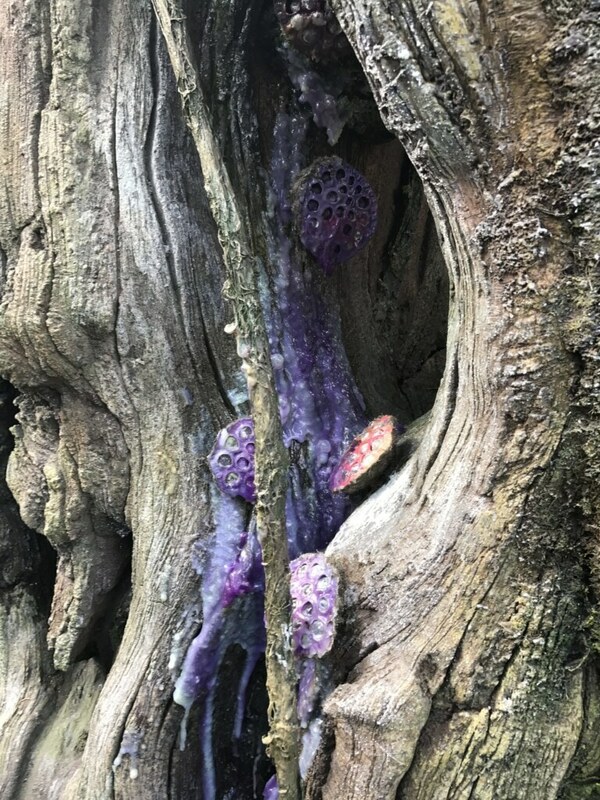 The colorful fingerlike plants. Glowing insect-like creatures. It’s all so entertaining to look at that you honestly don’t even realize you’re waiting on line for a good 30 to 45 minutes for a ride. The line is constantly moving and you are weaving in and out of this breathtaking landscape. Don’t you just want to reach out and touch these things? I only wish we had come at night so I could see these purple hive-like things glow bright. Of course that thing looks a lot like a bee hive so I”m a bit nervous the owners may return soon. The attention to detail is truly astounding. This shot is one I took by just looking straight up. 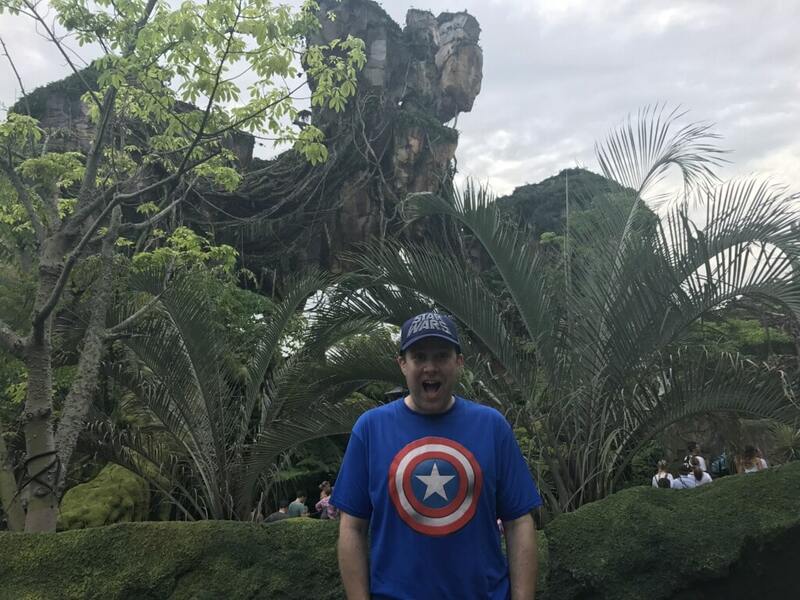 You really are immersed in the world of Avatar! Yep, there’s plenty of water too, don’t worry. I mean how else do you expect this plant life to grow? 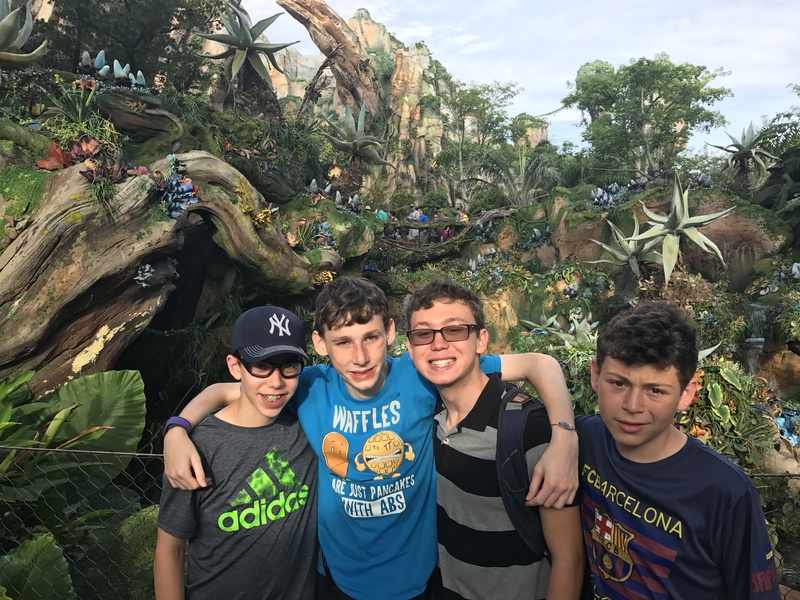 Despite being woken up at the crack of dawn, the kids (well, 75% of them) were super excited to be in Pandora. 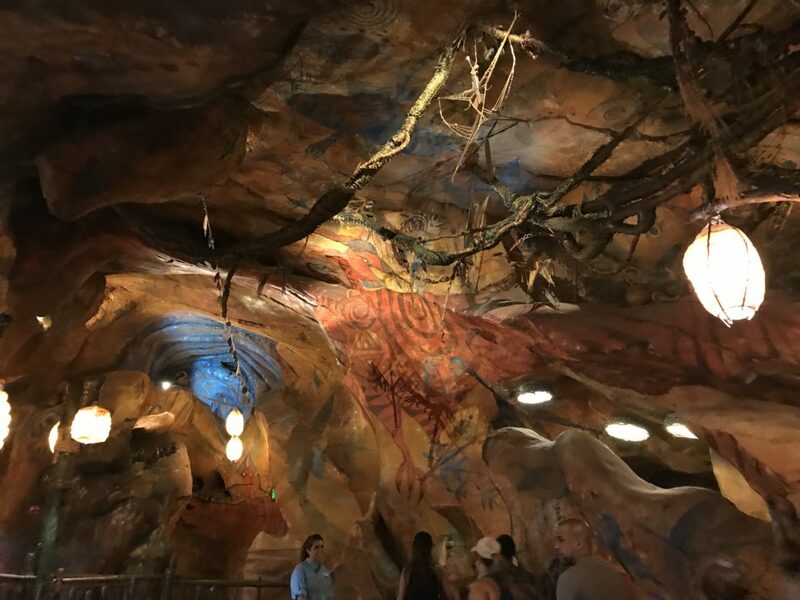 The line eventually takes you inside a cave where you can see all sorts of cave drawings by the Na’vi. 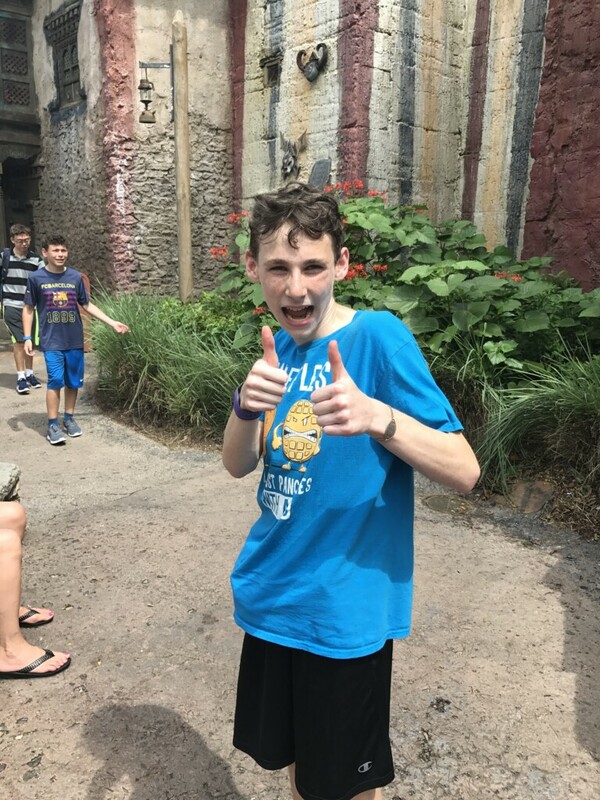 We finally made it into the ride! 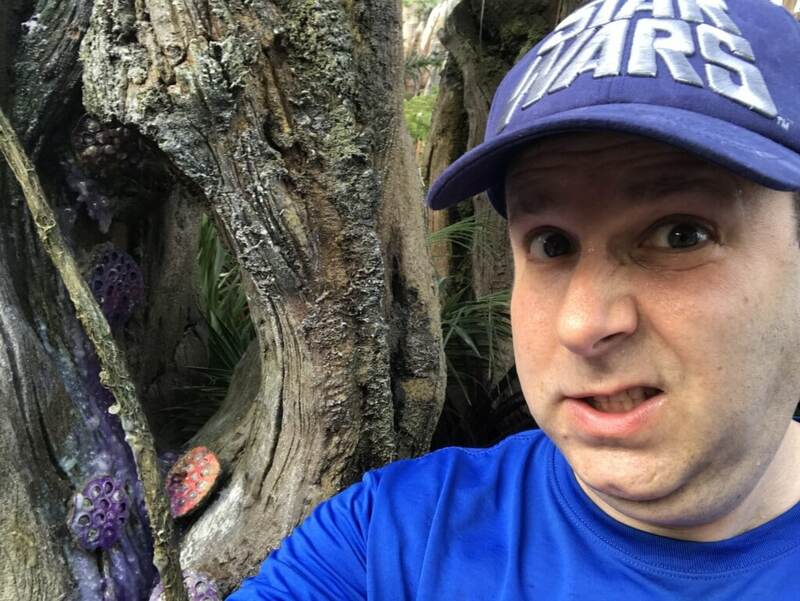 Avatar Flight of Passage really is an interactive experience of a lifetime. At first you get a short explanation of the entire world, along with the latest research project. 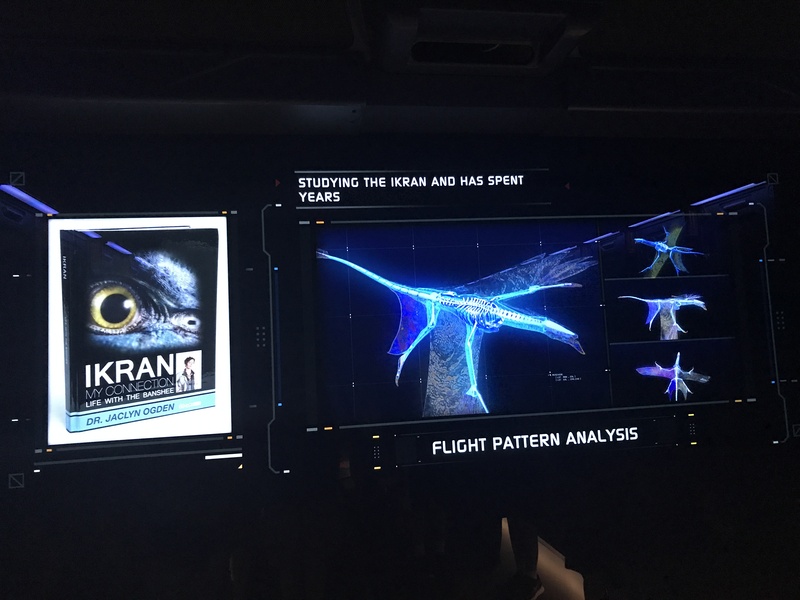 You even learn all about the Ikran (those are the super cool flying dinosaurs we call banshee), who you’re about to hop on and soar the skies with. After the video introduction concludes, you and the members of your party are synched up with an individual banshee. You form a bond and can start your adventure! Everyone sits on these motorcycle-like machines, leaning forward. When ready, a screen opens up and you literally feel like you are soaring high above ground. 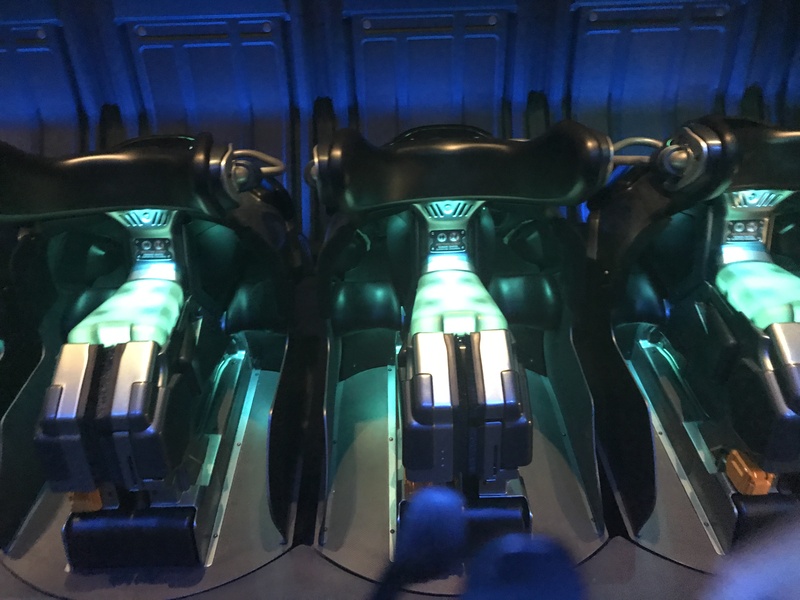 Yes, it’s a motion simulator ride (Similar to Flight over at Epcot), but unlike any you’ve ever tried. You’ll feel the wind on your face as you soar through the clouds. 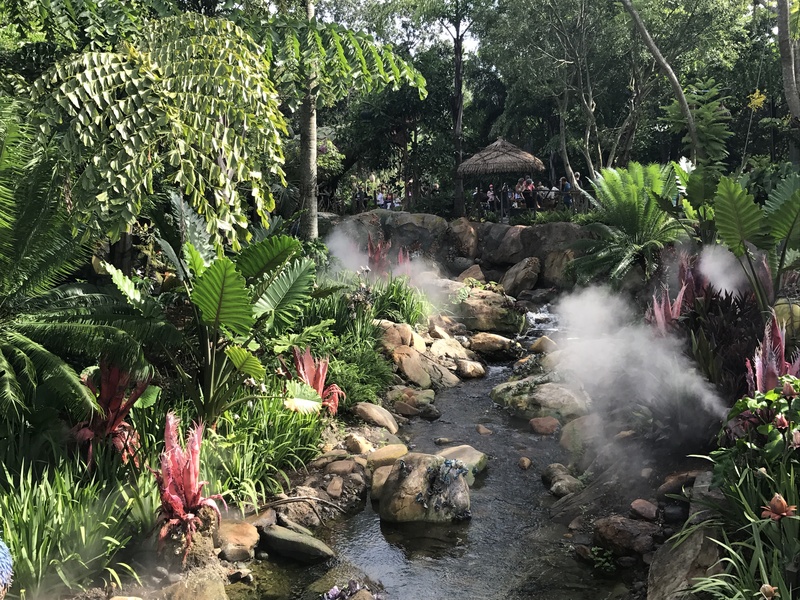 You’ll smell the fauna as you dive through the jungle. And even feel the mist and sprays of water as you zip over the ocean. 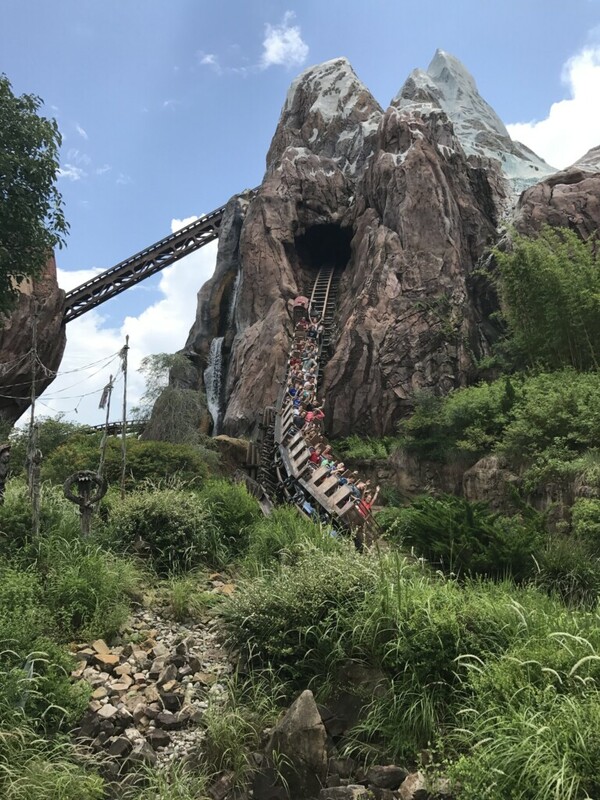 We ended up going on this ride twice during our vacation (getting up at the crack of dawn both times) because it’s just so unbelievably amazing. 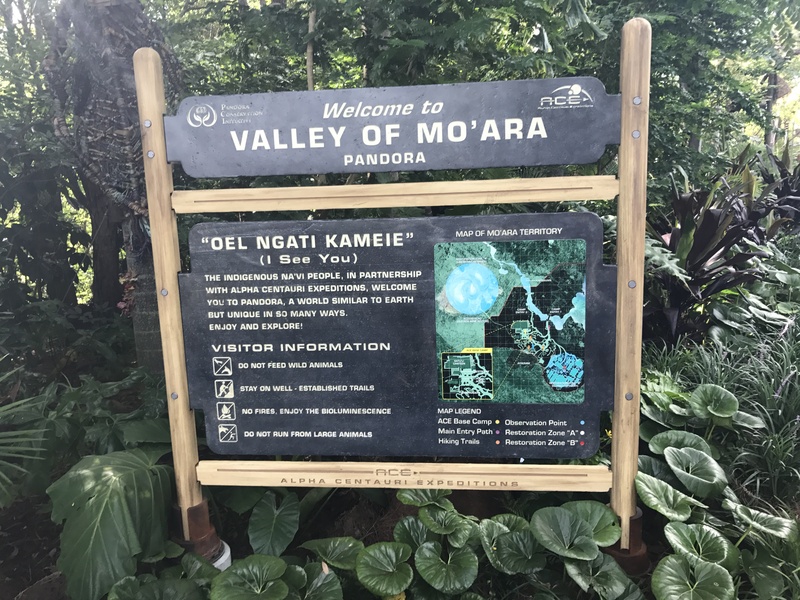 Even walking around the Valley of Mo’ara as it’s called is breathtaking. Just look at that view! 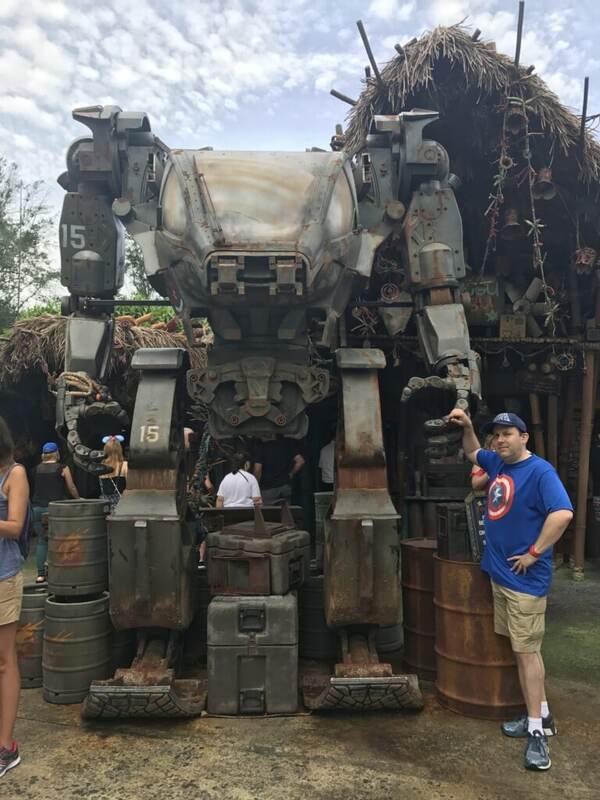 You never know just who you’re going to bump into at Animal Kingdom. Like this armor used by the soldiers in the historical battles between the humans and the Na’vi. Trust me, I was “this” close to hopping in this thing and cutting lines all over the park. 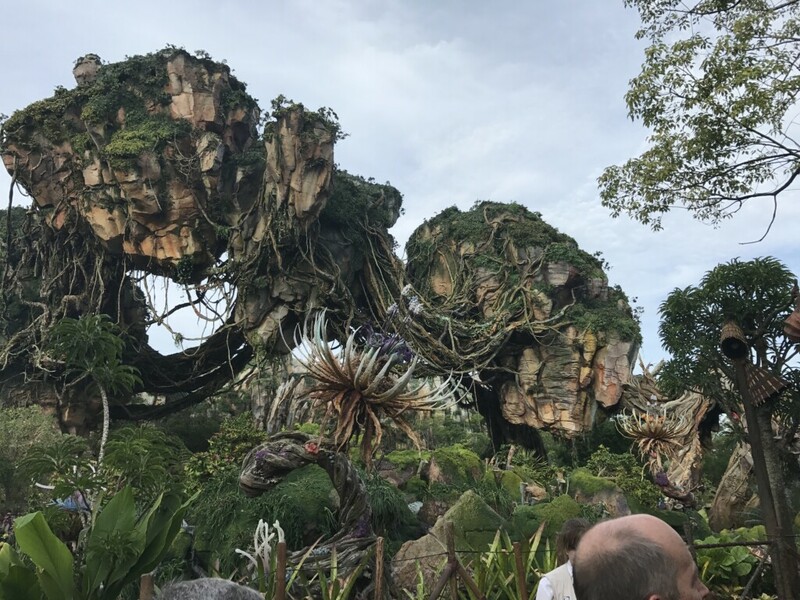 The other attraction in Pandora is the Na’vi River Journey. 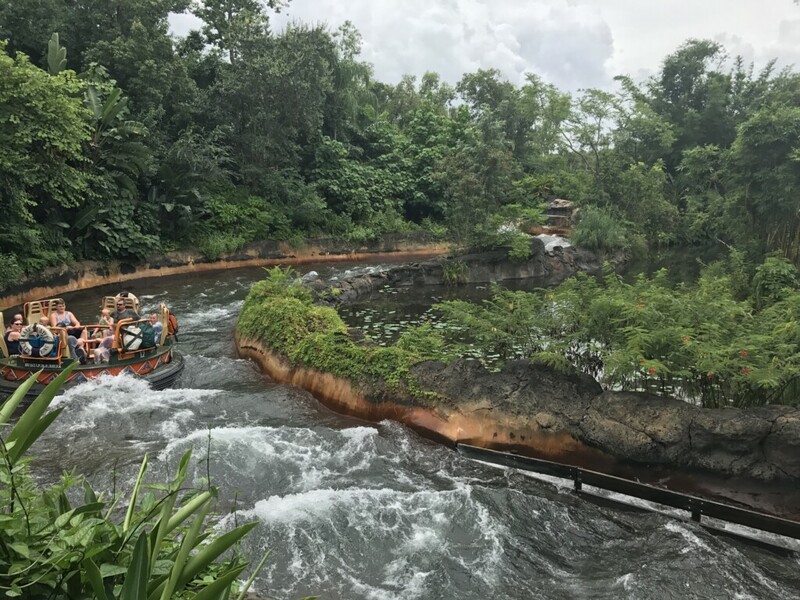 Unlike the Flight of Passage, this one’s a slow-moving boat down the river. 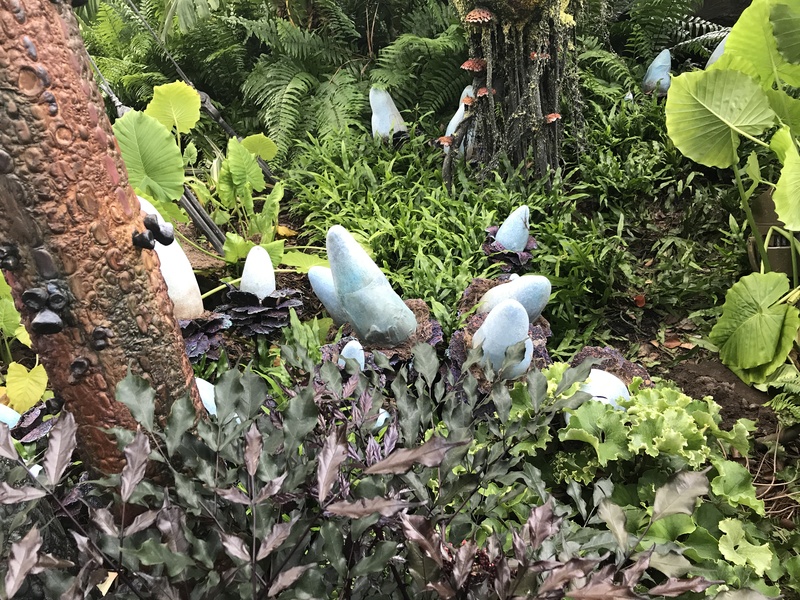 It’s full of more amazing wildlife and plants and you even get to see some of the Na’vi singing and dancing. 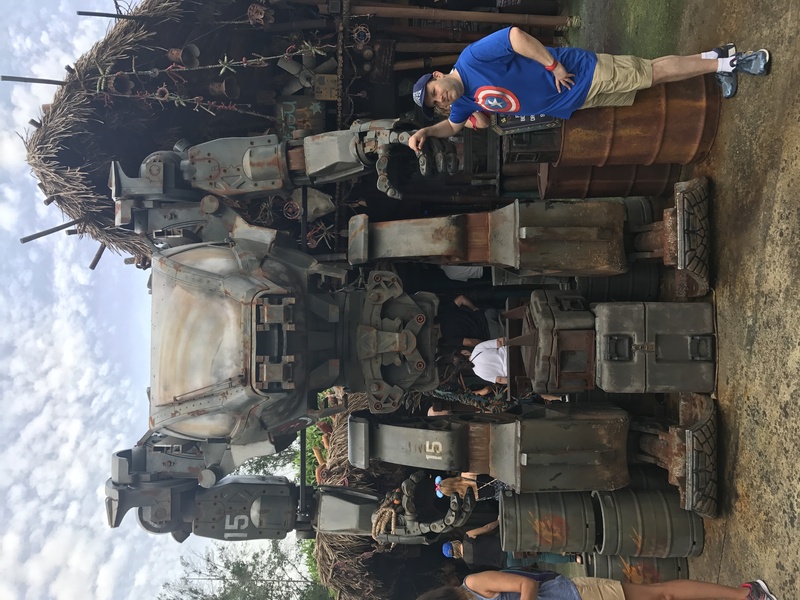 A mix of computer imagery and creepily realistic animatronics, you definitely feel like you’re stepping straight into the real Pandora. After the river tour (which even Ira said was doable for him. Much more his speed than other rides), we were all pretty hungry so we hit the Satu’Li Canteen and got some grub! 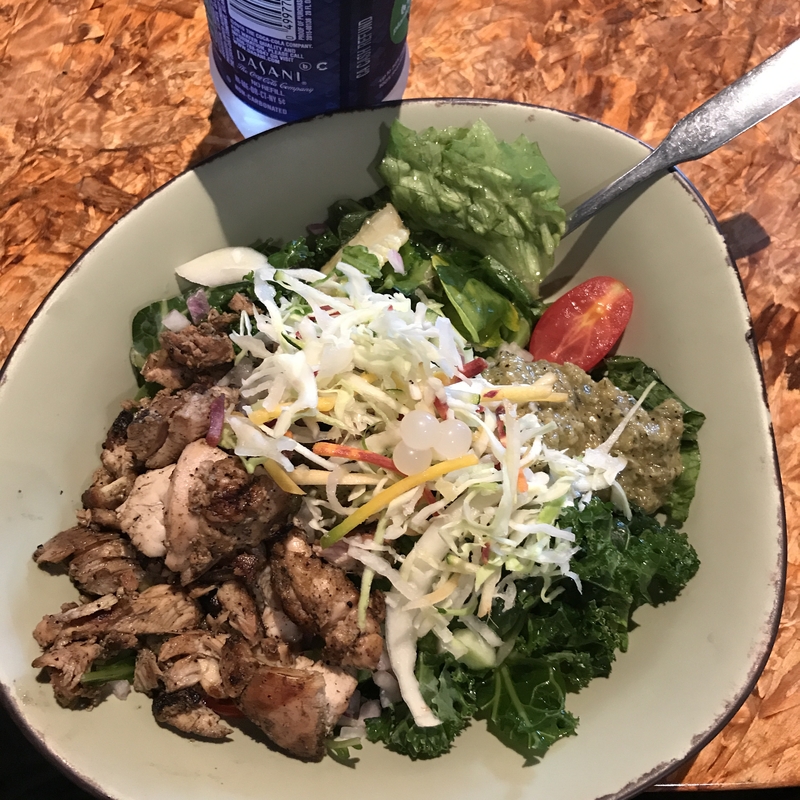 I got myself a Chopped-Wood Grilled Chicken Bowl and I have to say it was really good. I have no idea what those white Boba Balls in the center are but they were super tasty! Next up, we thought we’d get things moving again. So we headed over to Asia to totally make the kids’ day. We saw this giant Himalayan mountain the second we walked into the park. And we finally got to learn exactly what it was. 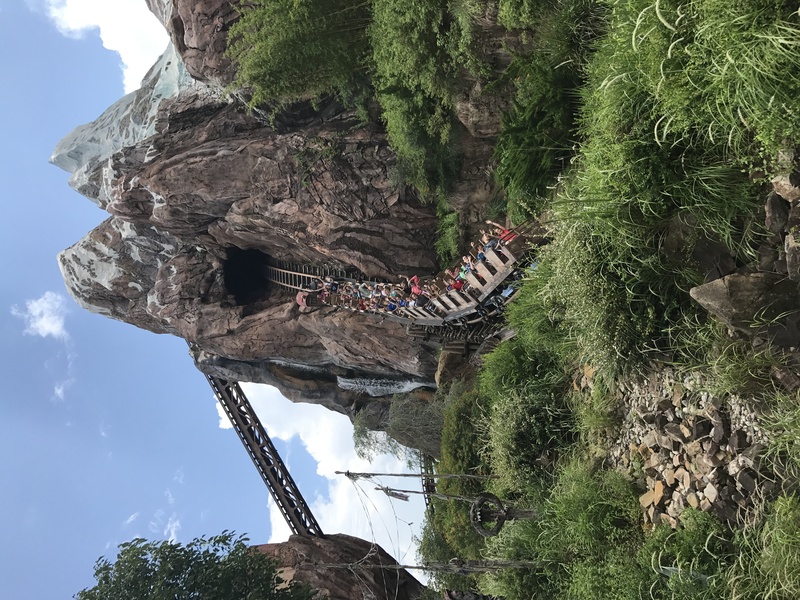 The Expedition Everest – Legend of the Forbidden Mountain rollercoaster! No, sir. 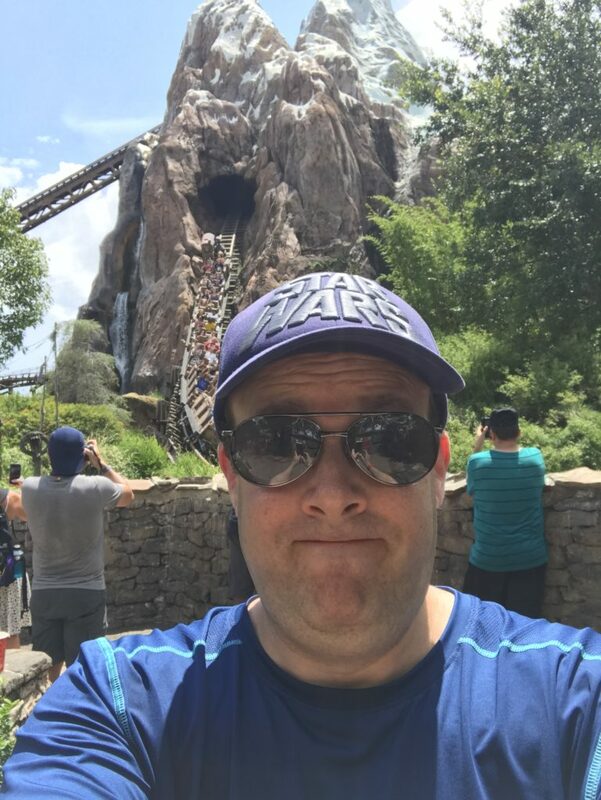 I’m not going on that thing! 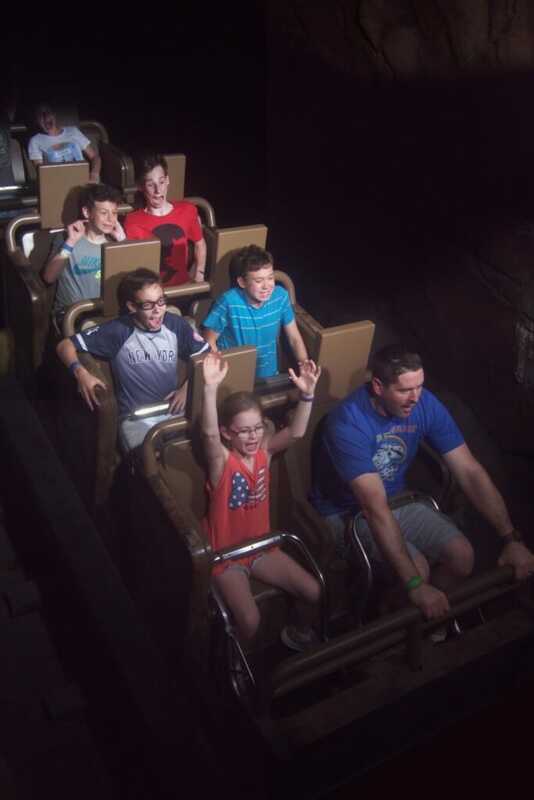 All four boys went on it, though and clearly a picture’s worth a thousand words. Right, Jason? Two big thumbs up from Ryan and Jason. They dug it so much they ended up going multiple times. What was I doing while the quartet was zipping through the Himalayan mountains on a rickety cart? Making friends, of course! 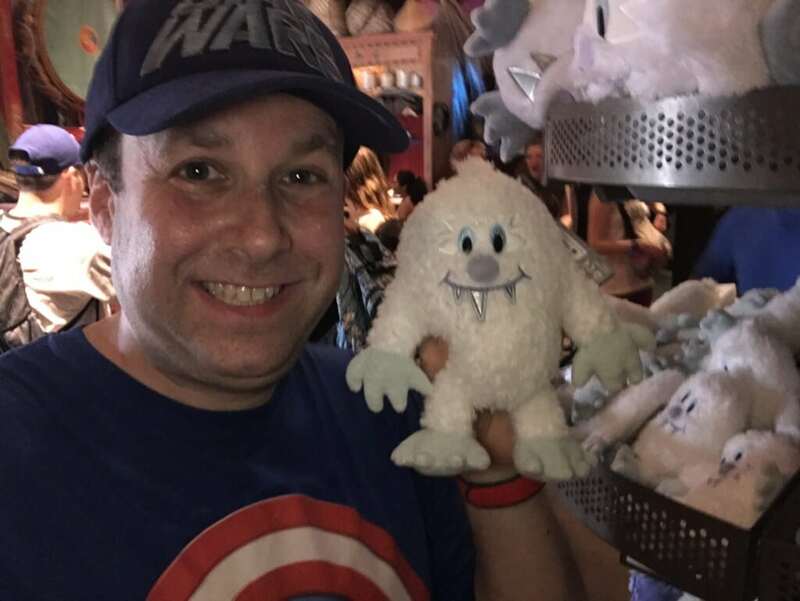 Me and the Abominable Snowman (a.k.a. 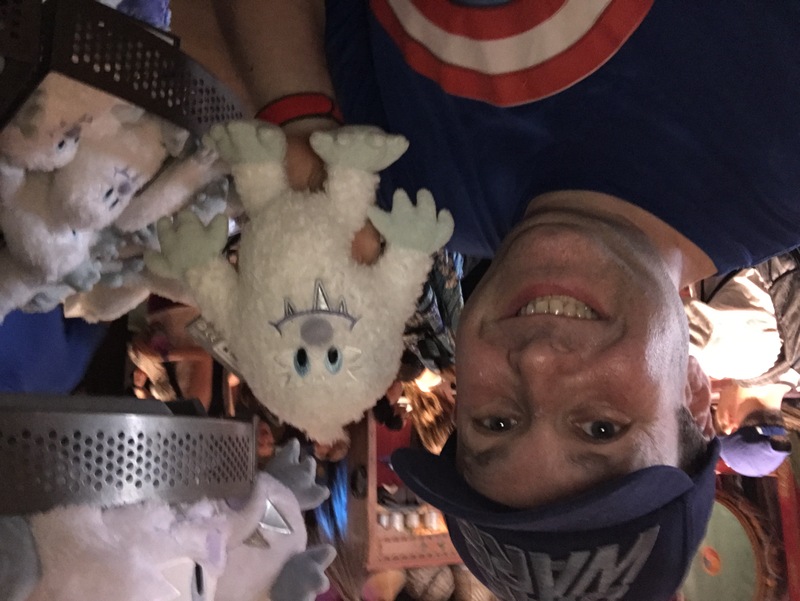 The Yeti) were bonding, while the kids encountered a much scarier version on the tracks. 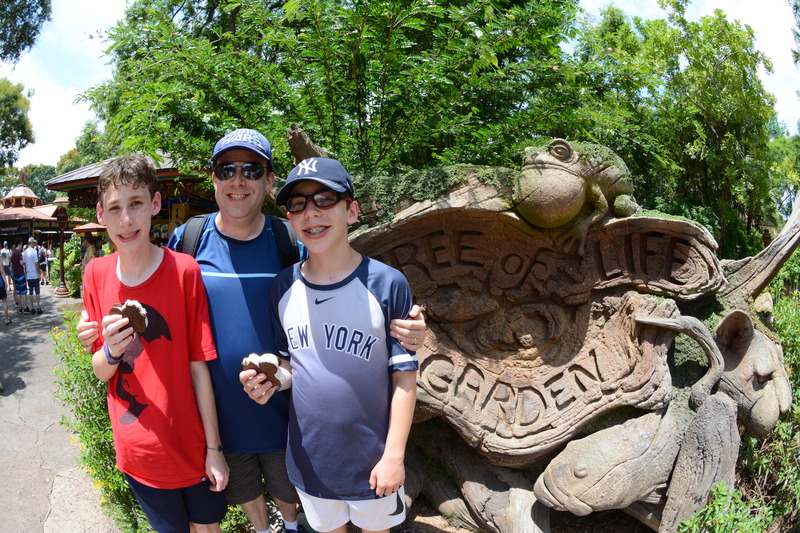 After watching my boys nearly lose their lunch, it was time to chill with the coolest monkeys this side of Rafiki. 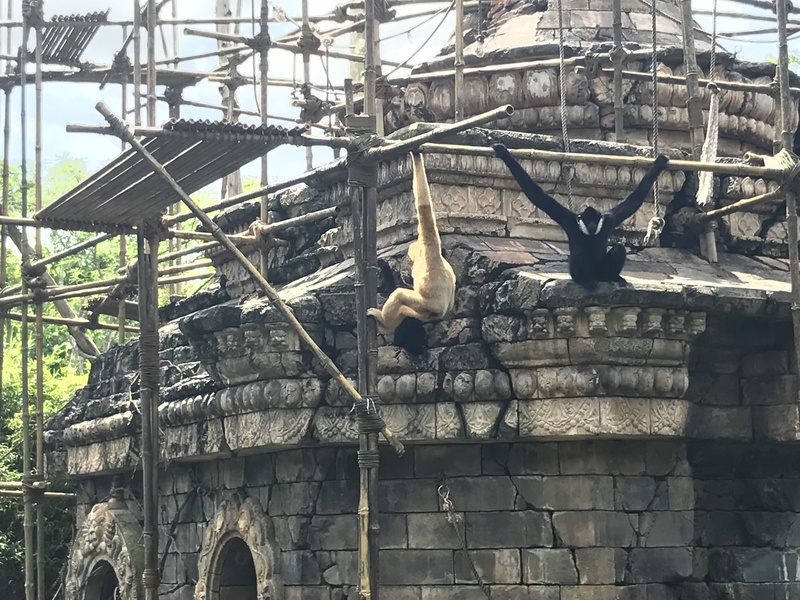 I think we sat by the Gibbons exhibit for a good 20 or 30 minutes just being fully entertained by these adorable little guys. Go on, take a look. Like I said, I could watch these guys forever. But sadly, it wasn’t up to me. So we eventually moved on and wouldn’t you know it, but right next to these kooky monkeys was the Kali River Rapids! 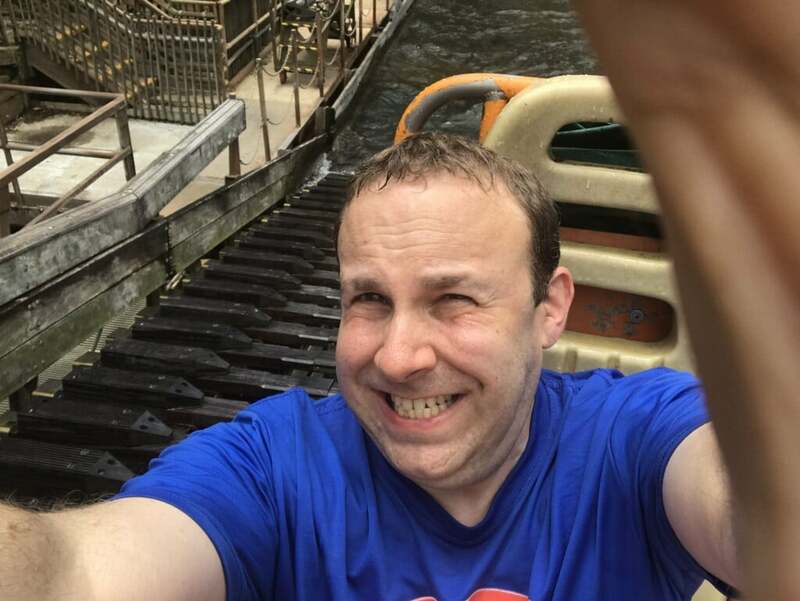 Besides showing off an incredibly flattering photo of myself, I’m giving you a glimpse of just how soaked you can get on this super fun ride at Animal Kingdom. Here’s a peak at the rough waters ahead. In case the splashing isn’t enough to get you, there are a slew of waterfalls, spouts and fountains to make sure you don’t get out of this bad boy unscathed. Each “raft” was big enough for 12 people! So the eight of us (that’s Allie’s cousins Ivy, Ira and their son Matt) easily fit on one big raft for full family fun. 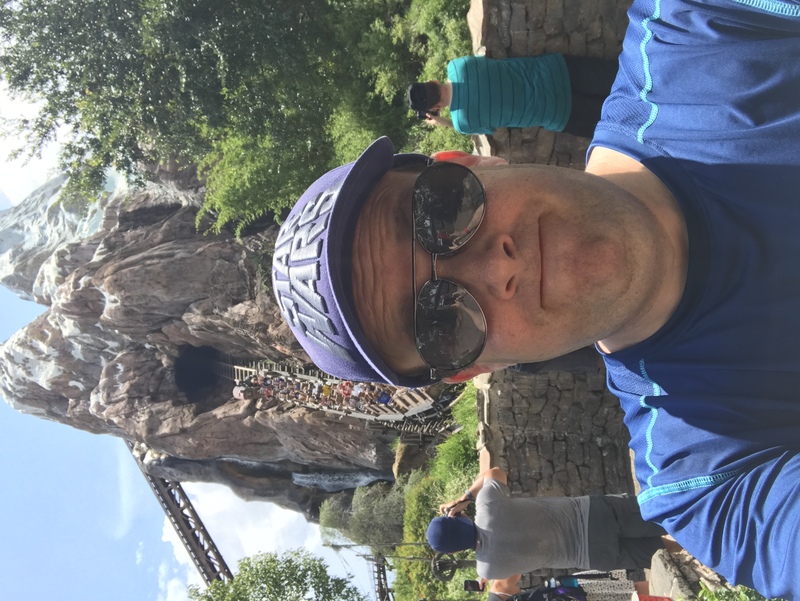 Did I mention how disgustingly hot and humid it was in Orlando during our visit? Well it was. Like seriously disgusting. 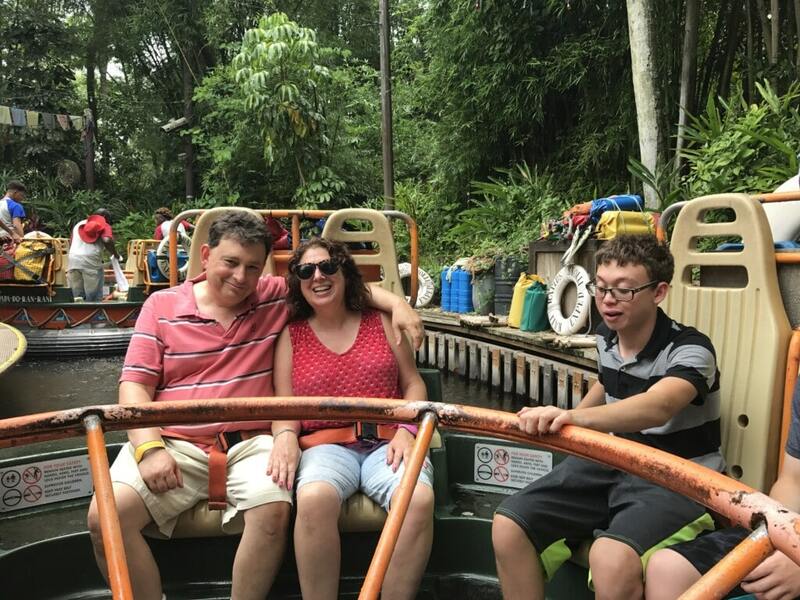 Which is why we probably went on the Kali River Rapids ride a number of times to cool down. 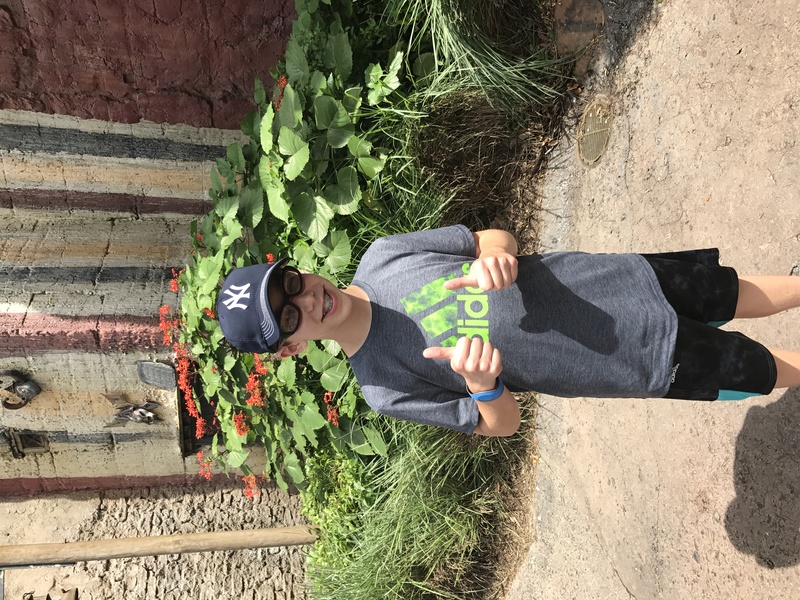 Leaving Asia, we set our sites for the next logical geographical location chock full of animals: DinoLAND USA! I don’t quite remember learning about this continent in elementary school but who am I to argue with Disney? While the kids went off to play some arcade/boardwalk-type games and ride the rollercoasters, I went in search of some serious prey. Y’see, my mom is a huge fan of Disney. In particular, she has this supreme love (okay fine, you could say obsession) for one very specific character: Goofy. Allie even made my mom a Goofy cake for her birthday a few years back. 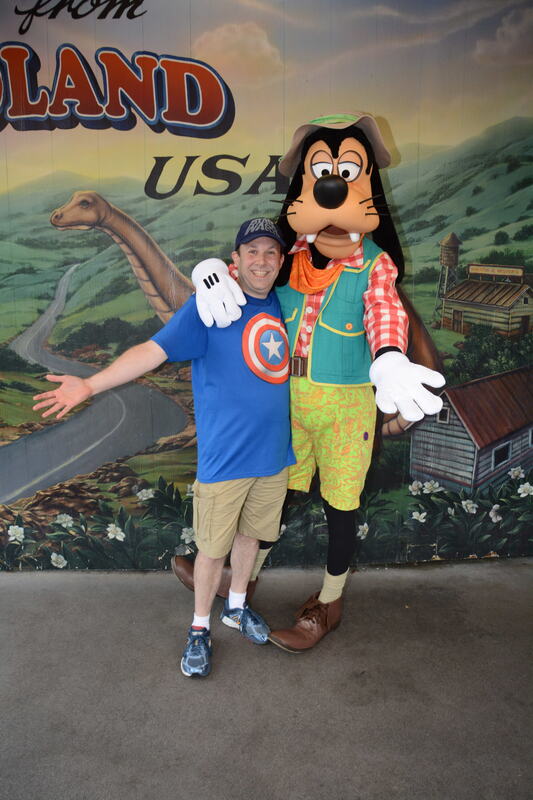 So finding Goofy on this vacation was a definite must. 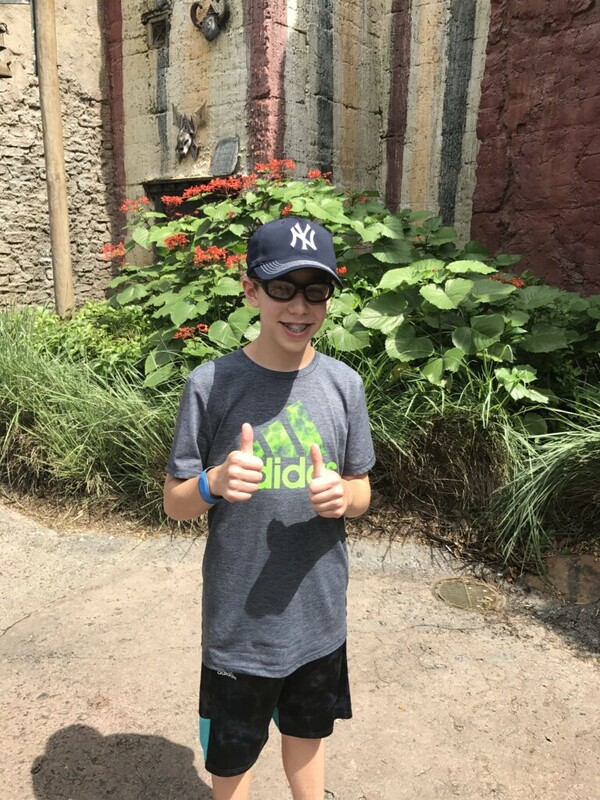 Getting a picture with the Gooftser was the challenge. Picture it. The temperature was a sweltering 197 degrees. The humidity was that of the Amazon Rainforest. I had walked a good 17 miles that day already. And then, as we entered DinoLAND… there he was. Long ears flopping in the breeze. Big bulbous black nose surrounded by a few scant whiskers. And of course those gigantic white-gloved hands. Yep, you guessed it, it was Goofy. Right here in DinoLAND! He was hanging out with Pluto at one of the picture-taking areas and the line was only about 15 people long. So I raced over to it and waited. And I sweat more while waiting. 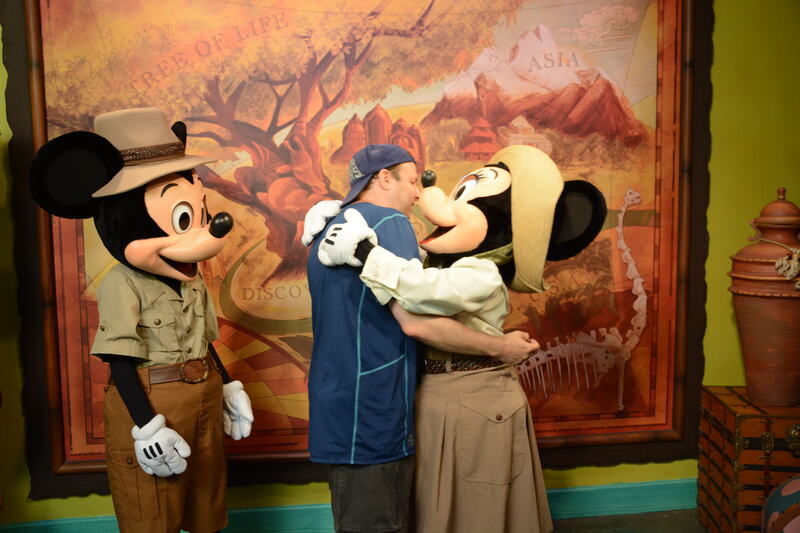 I told Goofy that my mom is his biggest fan and he blushed (I’m guessing). 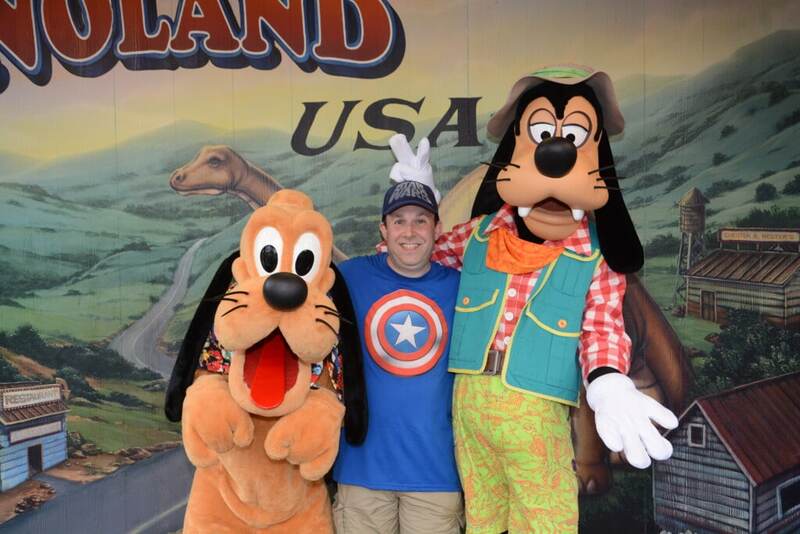 Then he and Pluto goofed around with me as two playful pups. 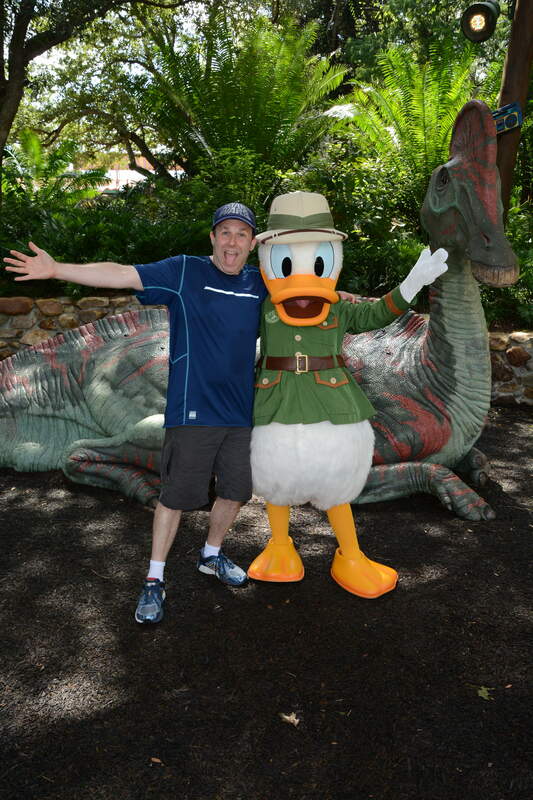 Right around the corner from Goofy and Pluto was another one of my favorite Disney characters… Mr. Donald Duck! In his dinosaur-exploring attire, Donald was actually incredibly gracious. Why was Donald in the DinoLAND area though? 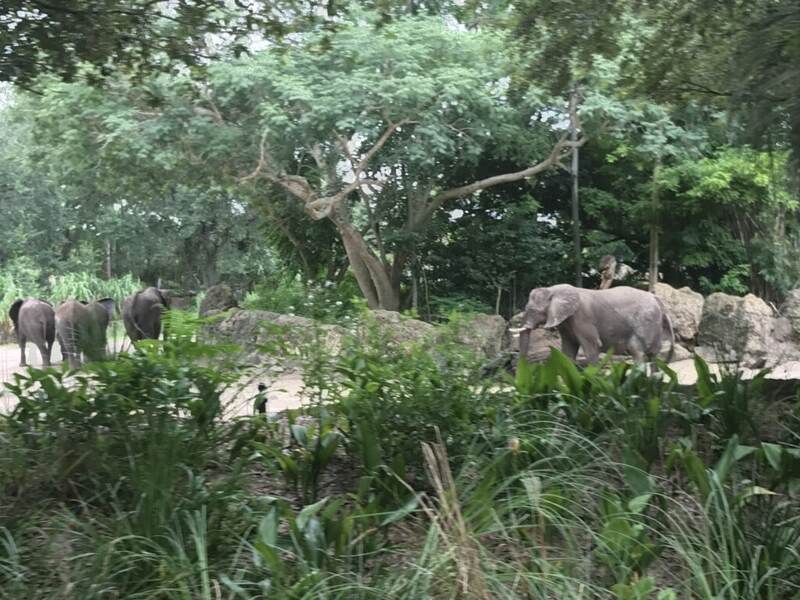 The other major highlight of our trip to Animal Kingdom had to be going on one of the Kilimanjaro Safaris. 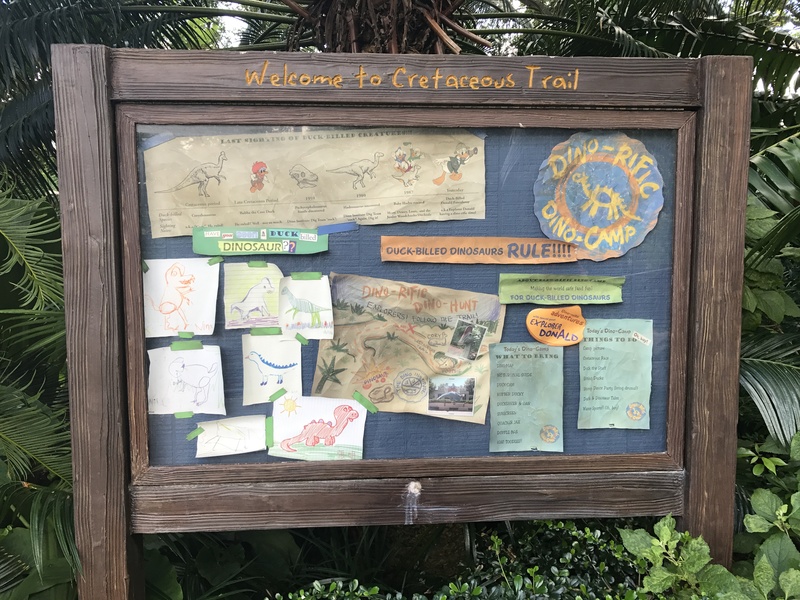 Besides the Avatar Flight of Passage ride, you need to FastPass a Safari too. For one thing, it’s a nice long rest for your legs! You’ll also see a ton of wild animals like you’ve never seen them before. Giraffes have always been my favorite. Ask my mom and she’ll go on and on about that one time when I was little and would not let us leave the Bronx Zoo until I saw the giraffes. 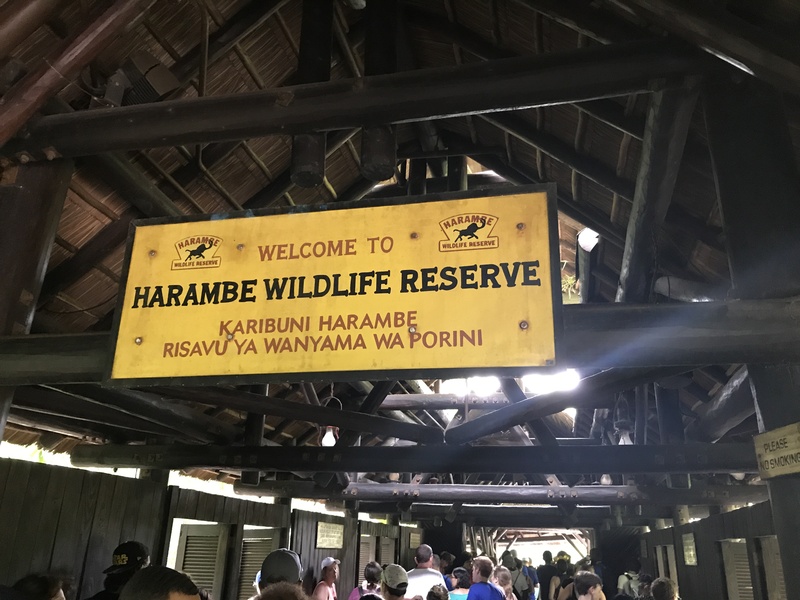 So we walked all the way around the entire zoo until we found them. 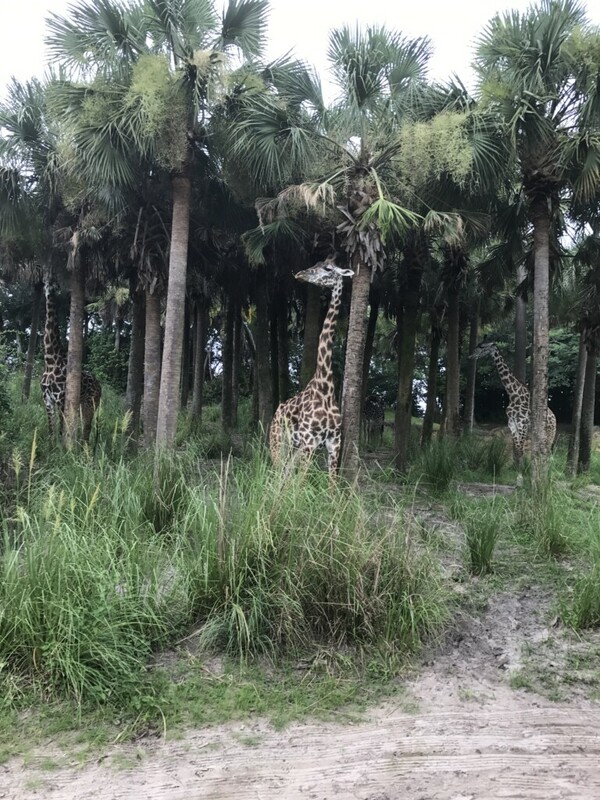 These giraffes at Animal Kingdom were probably as close as I ever got to one. And yeah, they are even taller in person. 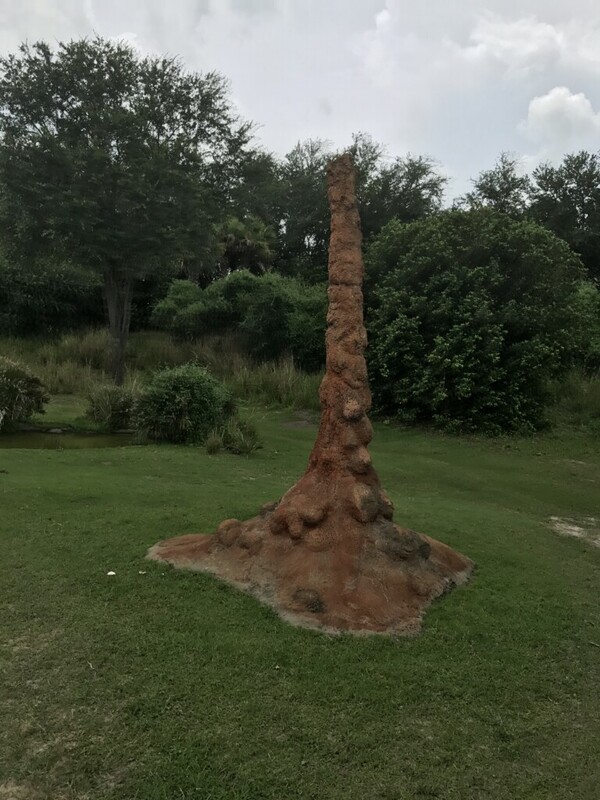 That’s actually a natural termite mound! 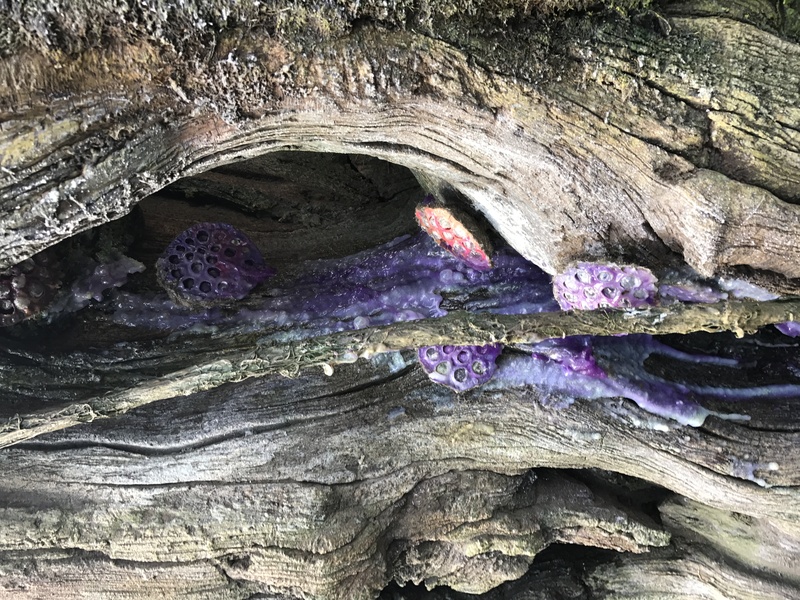 There were tons of these crazy cool (yet disgusting at the same time!) towers all over the safari. 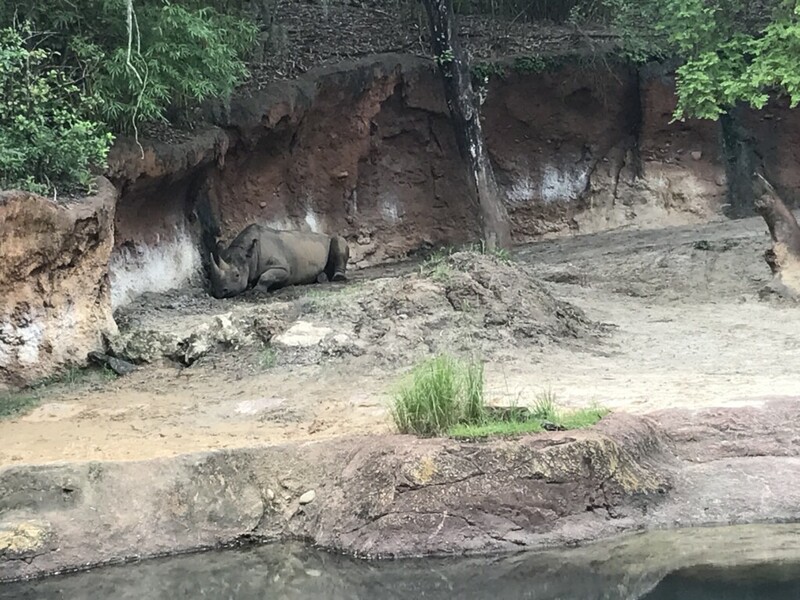 That rhino’s definitely got the right idea in this heat. We saw all sorts of crazy wildlife, like these two smiling critters in front of us. If you need a helping hand, the safari jeep has a nice animal chart on top to help you identify some of the animals. 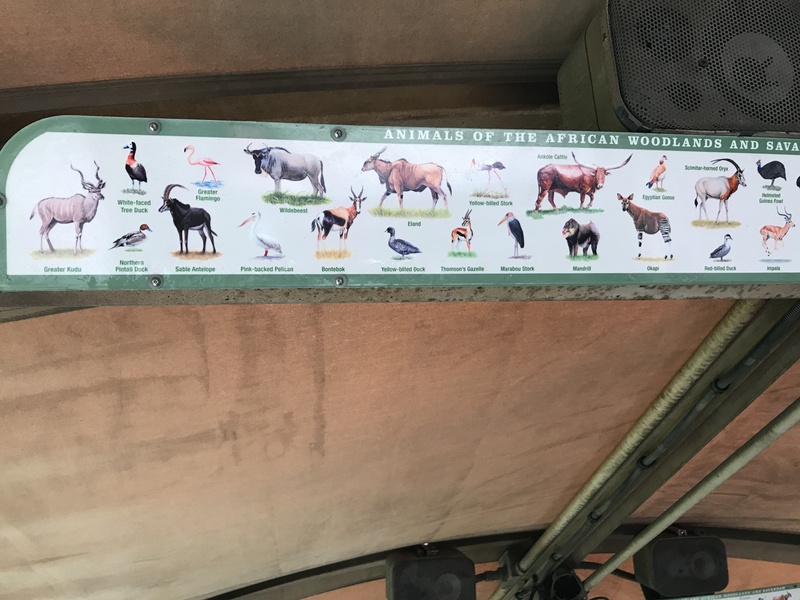 We saw so many more too, like flamingos, lions, hippos, okapis, crocodiles, gazelles, etc. In total, you have a shot at seeing nearly three dozen different animal species. If we had more time, I would have loved to go back another day for a safari to possibly see some different animals. 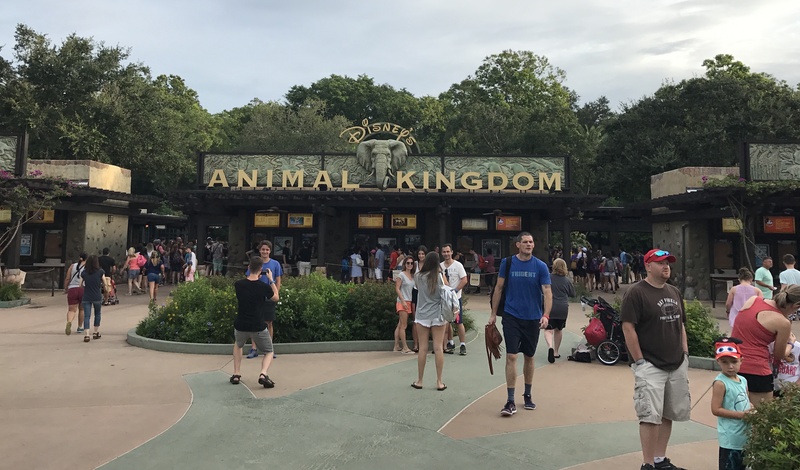 There was so much more to Disney’s Animal Kingdom but those are just the highlights. 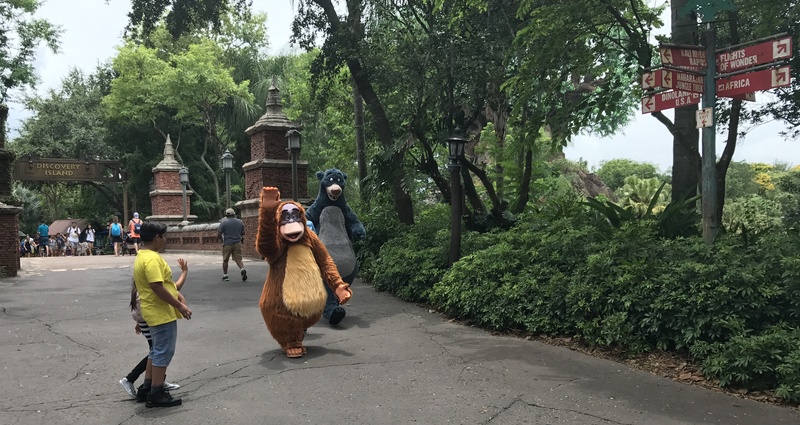 I honestly wasn’t expecting much before we started the day, but I think I may have enjoyed this park the most out of them all! 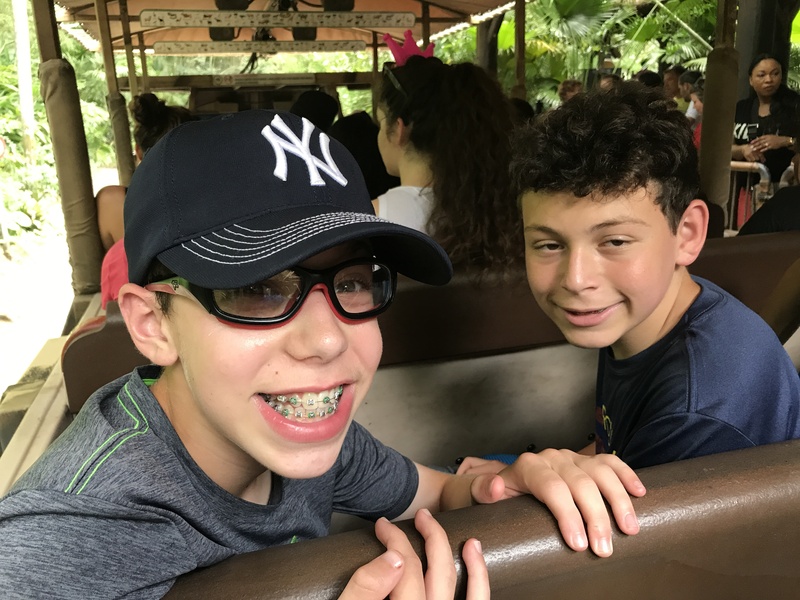 Each country is so different than the other and it’s just a wonderful mix of crazy rides, fun adventures and amazing exhibits. 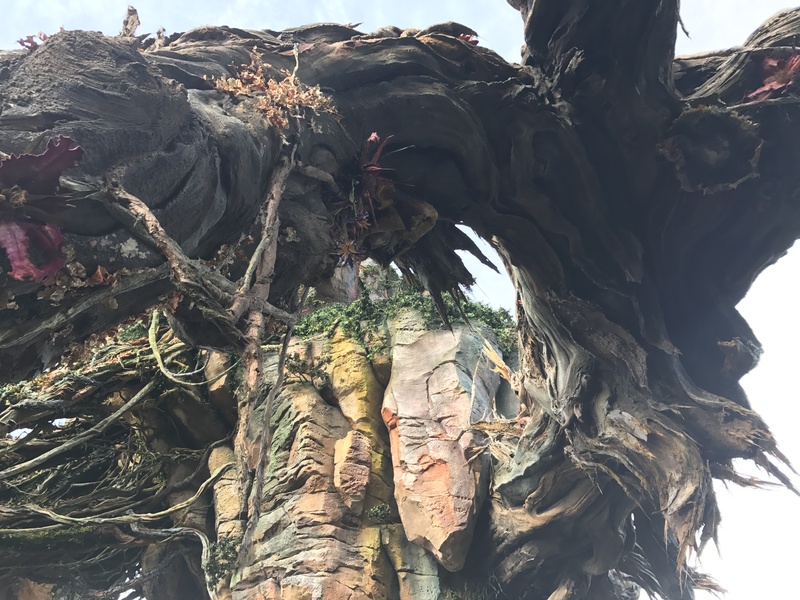 To wrap things up, here are a few last-minute random highlights from our Animal Kingdom adventure! Okay, so I spent a lot of time at the Starbucks sipping iced coffee. 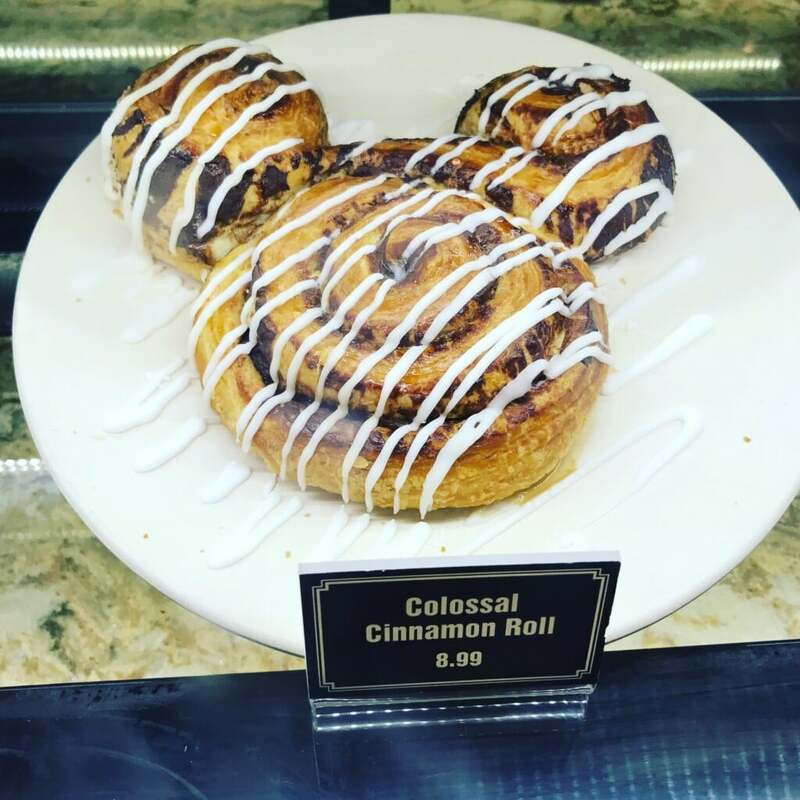 But come on, how deliciously awesome is this Mickey Mouse Cinnamon Roll? 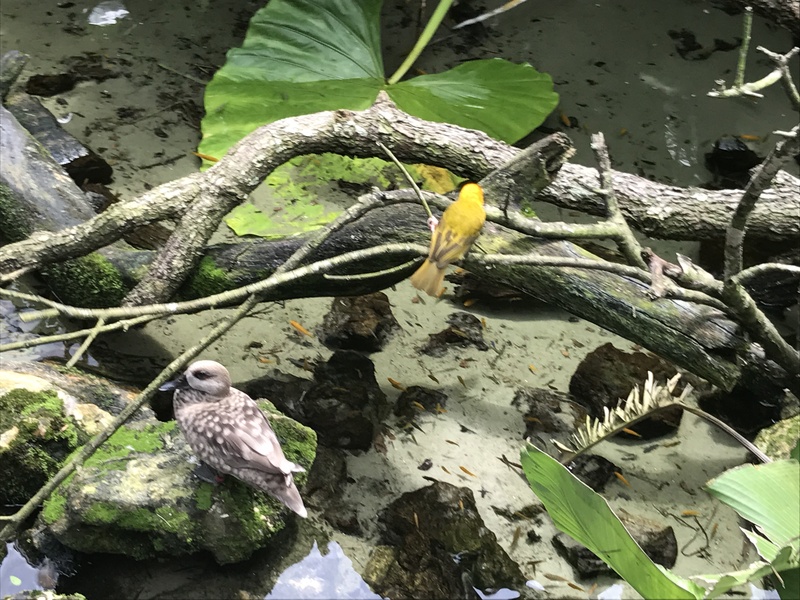 There’s a really cool aviary to walk through, chock full of some of the most gorgeous birds you’ll ever see, like this little yellow guy. 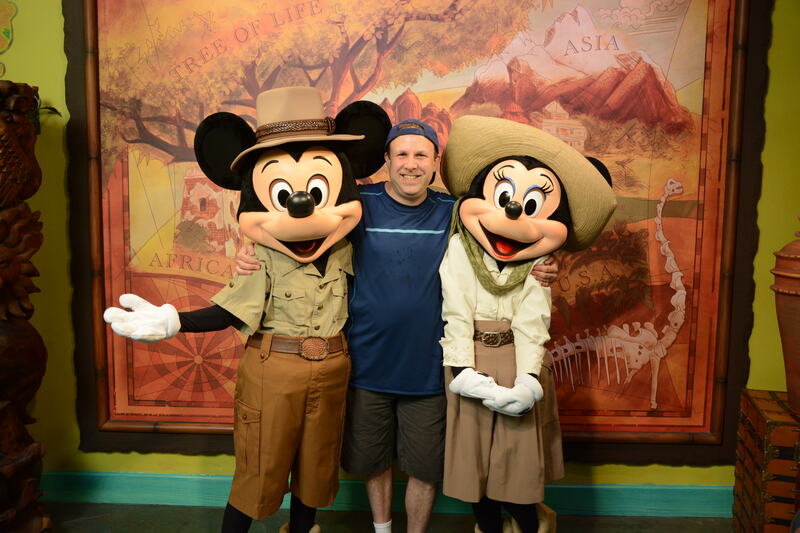 I managed to hook up with Mickey and Minnie in the Adventurer’s Outpost! But uh, when Minnie went to give me a really swell greeting, Mickey didn’t take too kindly. Yeah. Um. I’m still trying to explain this one to the wife. 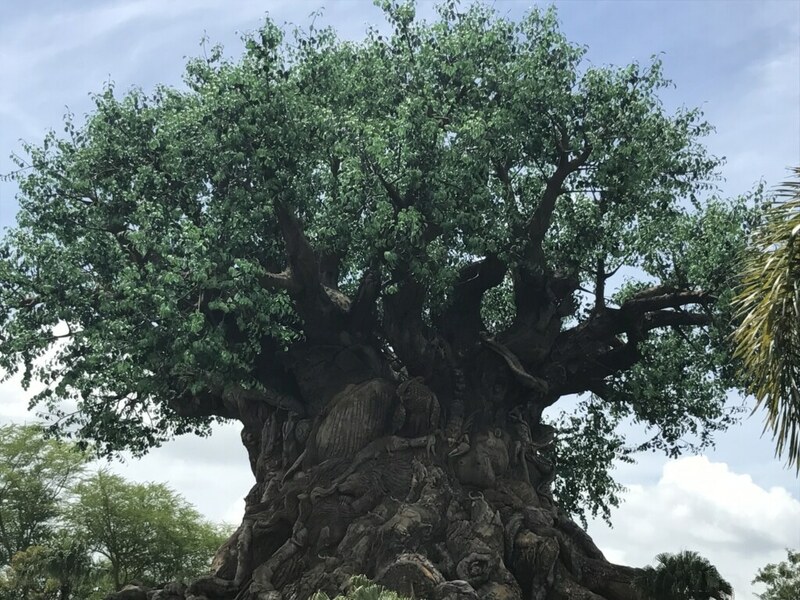 In the center of the park is this ginormous and breathtaking Tree of Life. You’ll see all sorts of animals carved into its trunk. 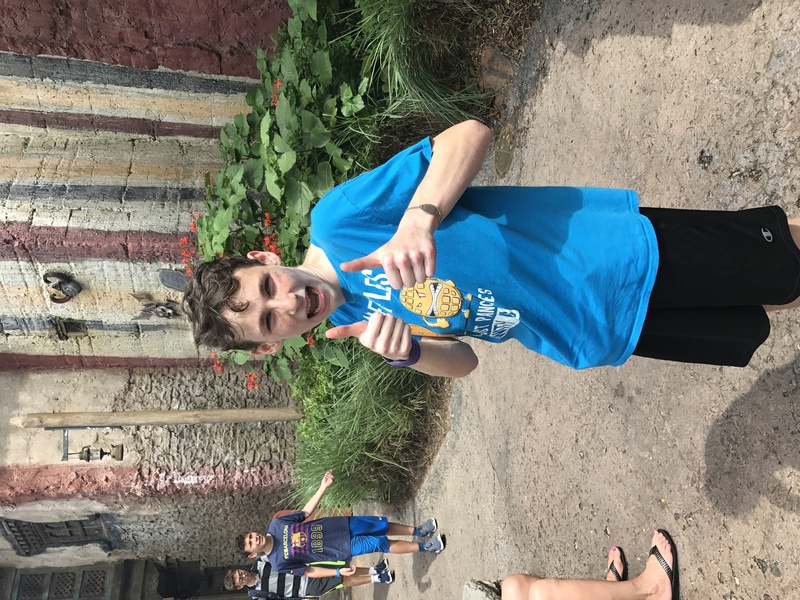 And that sums up my Animal Kingdom round-up! Hope you had as much fun following along as we had actually going through it all. 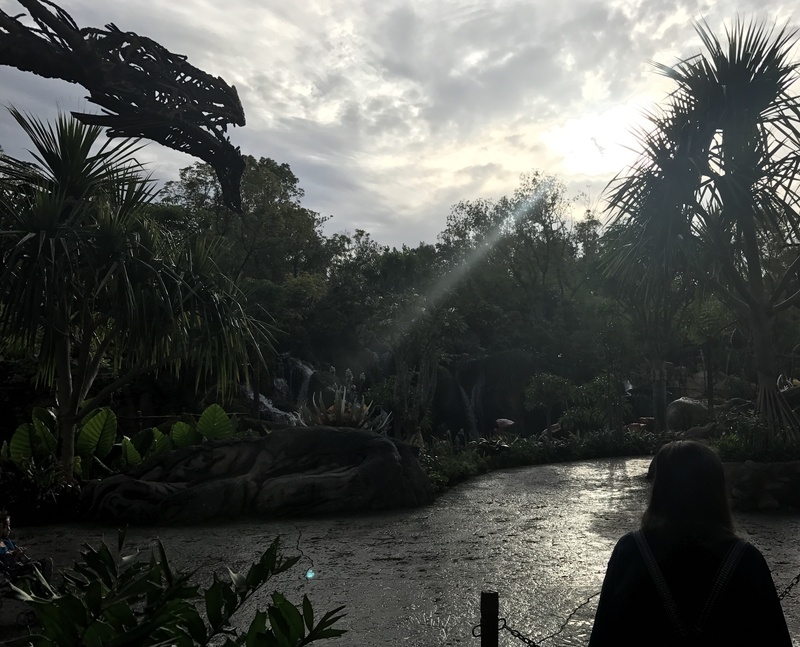 What do you love about Animal Kingdom?